Let me get back to a couple of days we spent in Vienna last Decmber. I have already written about its Christmas markets and museums, and I'd like to tell you one more story about a beautiful day we spent there eating the most famous Viennese cake (can you guess which one is it? 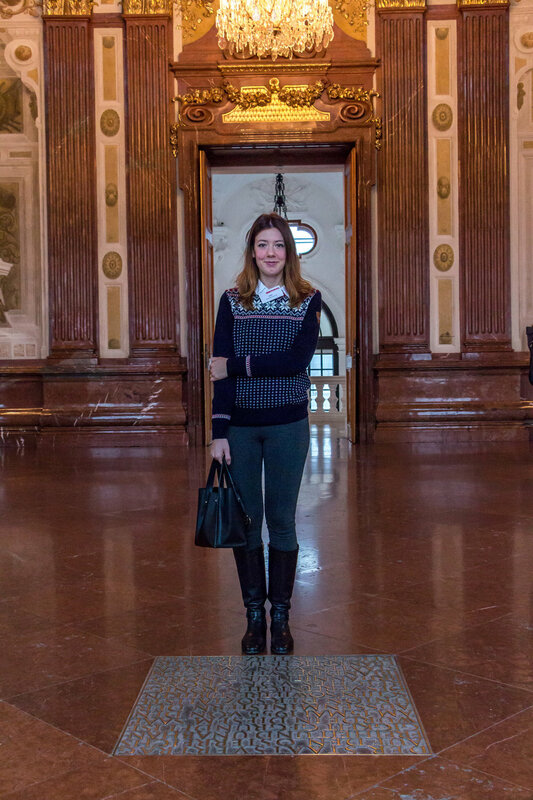 :)), warming up in a palace (surrounded by art, of course) and visiting a contemporary art exhibition. First thing in the morning (and it was a bright and sunny one), we headed to Sacher hotel, where we arranged a meeting with lovely Mrs Artacker, who offered to give us a little tour of the hotel, followed by inevitable visit to the Cafe and tasting of their most famous product, the chocolate cake. The whole history of the hotel started with that cake, when young sixteen year old apprentice (that is, Franz Sacher) got the opportunity to make a dessert for a dinner organized by then Austrian minister of foreign affairs, Prince Metternich in 1832. The chocolate cake that he invented turned out to be divine, as it is famous to this day, with the original recipe still being kept as a closely guarded secret. Franz Sacher's son, Eduard opened a hotel in Vienna in 1876, based on the reputation his father made with the Sachertorte. The hotel today makes you feel like stepping back in time; the original interior design with all the chandeliers, festive draperies and antique furniture; the ever polite staff which will always hold a door, take your bag and ask if there was anything they could help with. We sat down for a drink (hot chocolate) and a Sacherorte (because if you're at Sacher, then you might as well have everything chocolate) in a dusky setting of the Blue Bar. The simple, chocolatty flavour (oh, and the texture!) with a hint of fruit was just what we needed on a winter morning in Vienna, all spiced up with the festive atmosphere of the hotel. Last time I visited the Belvedere palace was when I was fourteen year old Vienna / 18th century enthusiast (as funny as it may sound), but I don't seem to remember much of its art collections. The Belvedere collection is mainly known for Klimt's paintings, his Kiss being the most famous of all (and the most exploited as a print on every Vienna-related souvenir). My personal favorites are his landscapes in the other room, so flowery and colorful, that you could almost smell the spring, the apple orchards, the meadows. The Belvedere is also a beautiful Baroque palace, built as a summer residence for Prince Eugene of Savoy in the first half of 18th century. I have to admit that given its beautiful gardens, water features and the layout of the complex (there is a lower and an upper palace), the nicest time to visit would be spring or summer. Winters in Vienna have their charms and I love visiting then (oh how festive they are! ), but I'm thinking now of a visit to Vienna in spring, when all it's charming parks come to life and the weather is warm enough to enjoy Viennese Baroque architecture all day long! In the neighbourhood of Belvedere palace stands 21er Haus, a 20th century building and a home to the Belvedere's contemporary art collection (you can buy combined tickets at the Upper Belvedere Ticket Office). The building was designed by Austrian architect Karl Schwanzer as an Austrian Pavillion for World Exhibition Expo '58, held in Brussels (the well known Atomium was designed for that same exhibiton, and how different those two buildings are in their approach!). Somehow we always end up enjoying contemporary art exhibitions the most, be it that there are significantly less visitors there, or that the architecture itself is always interesting, with its giant open spaces and lots of glass, or that contemporary art in fact echoes the world of a modern man. This exhibition was no exception, and we ended up with a conclusion that we have to visit 21er Haus each time we go to Vienna! After a couple of days trying to reserve Salm Brau beerhouse in the neighbourhood of Belvedere, we went there without a reservation and (surprise, surprise) got us a table. And how perfect evening to a great day it was! We had ribs and beer (we were in Vienna after all) and they just might be the most delicious ribs I ever had. I don't know if the tiredness and winter air had anything to do with it, but I am still dreaming about that dinner. This is the last post about Vienna for know (till the next time I visit), and I would love to hear some of your thoughts. Is all this art talk interesting to you, or too much? This article was made possible thanks to the Sacher Hotel, Belvedere Museum and 21er Haus, and I thank them for that. We had a truly wonderful experience and we're looking forward to our next visit.